The balance of the first half of 2018 in the Bahian real estate market arrived with good news. 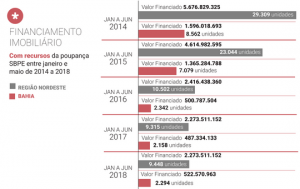 After four consecutive years of decline, real estate credit contracted again in Bahia (7.23% in relation to the first half of 2017), according to the Brazilian Association of Real Estate Credit and Savings Entities (Abecip). This increase translates into a 12% increase in sales compared to the same period last year, a result mainly driven by business in the popular housing segment. Although the percentage is considered shy of the initial forecasts, the news points to a second half even better for companies and with more news for consumers. Understanding the picture of reaction is not difficult. Still in the first quarter, the volume of launches of new ventures grew, surpassing the mark of the same period of 2017 in about 50%, according to the Association of Business Managers of the Real Estate Market of Bahia (Ademi-BA). In addition, the reopening of the pro-quota financing line, by Caixa Econômica, in January, made it easier for consumers to return to using FGTS in the purchase of the property. The recovery intensified in April, when the same Caixa reduced interest rates and increased the financing ceiling, provoking a reaction from competitors, which had even lower rates. “The first half followed the pattern of reaction started last year. The more stable policy has restored consumer confidence, which has returned to buy, and the new rules of financing have brought the customer back to the negotiating table, “says Ademi-BA president and CORREIO columnist Claudio Cunha. Even with the breakthroughs in the market, he notes that there is scope for improvement, including a new round of interest reduction for homeownership. 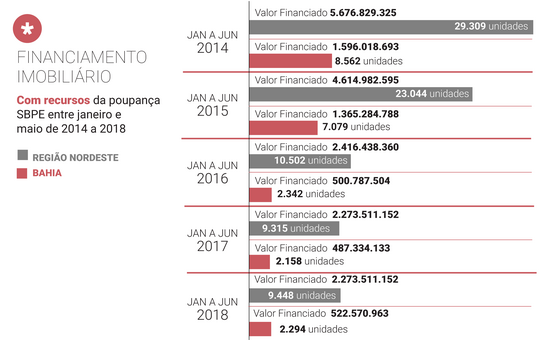 In order not to let the good news pass, builders and real estate agents mobilized in campaigns to liquidate the inventory of ready-made units between May and June, such as Feirão da Caixa, which handled more than 1.1 billion in business, in only a weekend in Salvador. The highlight was the popular ventures offered by companies such as MRV and Tenda. “This year we closed the semester with 45% more sales compared to the 2017 period, with more than 160 units sold at Feirão Caixa alone,” says MRV regional manager Luis Felipe Monteiro. “The stand space that Caixa has given to us and the Tenda has been bigger than the companies that work in medium and high standards, which is a recognition that the popular housing is the main business generator of the event,” he adds. Carlos Henrique Passos, president of the Union of the Construction Industry of the State of Bahia (Sinduscon-BA) and partner of Graphic Empreendimentos, which has participation in the popular housing sector in inland cities, says that the business environment was also strengthened outside the capital. He adds that industry expectations for the second half are on the rise. “During the Feirão da Caixa in Vitória da Conquista we were surprised by the amount of people who participated in the event, on a rainy weekend amid the truckers’ strike,” he says. “The results were good. For the Graphic we felt a progress in the response of the public since in the first half of this year we sold 150 units, while in the 12 months of 2017 we sold only 190 “. For the second half of the year, the expectation of companies is that sales will gain more volume thanks to new launches and the increase in consumer purchasing power because of the 13th salary. “Traditionally, the second semester is stronger. Let’s take advantage of and make the Real Estate Show in October that will bring you excellent real estate opportunities ready to live at competitive prices. With controlled inflation and GDP growth forecast we will close a much better year than the previous ones, “says the president of Ademi-BA. Pituba continues to reign supreme among the most desired neighborhoods of Salvador, according to the survey conducted by the Zap Group at the request of CORREIO. 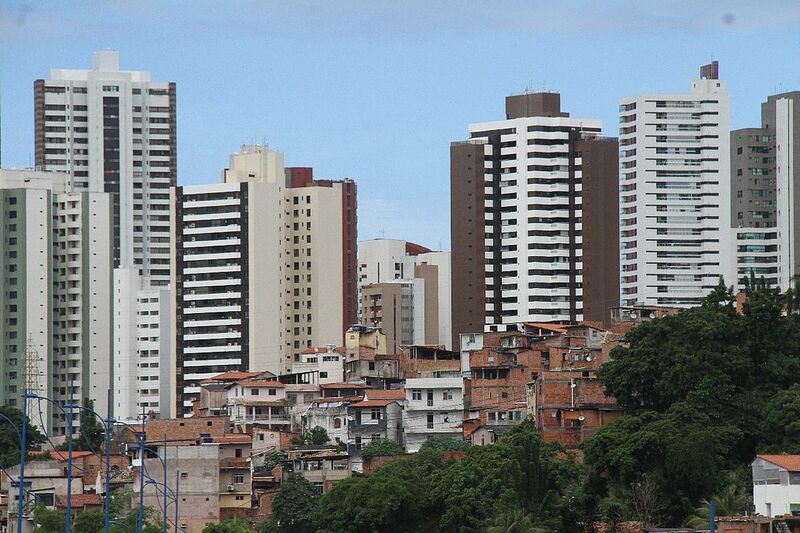 The neighborhood, formerly beloved by the Soteropolitan, renewed its pre-eminence throughout the first half of 2018, followed by Imbuí, Costa Azul, Brotas, Barra, Cabinho das Árbores, Cabula, Rio Vermelho, Graça and Armação in the ranking of searches on the platforms from the company. Corretora and second vice-president of the Regional Council of Real Estate Brokers of Bahia (Creci-BA), José Alberto de Vasconcellos attributes preference for neighborhoods such as Pituba, Imbuí and Costa Azul to new developments throughout the period, a fact that attracted attention of who is in search of a new place to live. “These are regions that are receiving new launches or whose inventories are growing due to the delivery of buildings that were in the final phase,” he says. “In addition, they follow the logic of consolidated trade and services infrastructure,” he adds. The reflection of insecurity, according to Jose Alberto, is a factor that ends up contributing in favor of rent, a move that, according to the broker, was felt even in an atypical month like June. “Normally, June is a slower time for rental contracts, but I was a bit overwhelmed by the volume of contracts we registered, despite following the growing trend of the lease option since the beginning of the year,” he says. According to the Zap Group survey, the lease in Salvador suffered a slight deceleration from April and remained constant until the end of the half, up 3.38% thanks to the positive balance accumulated by this type of trading since June last year.